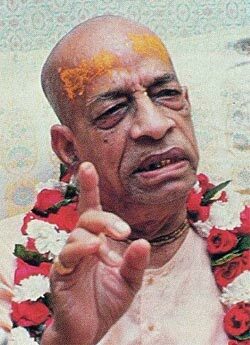 The following exchange between His Divine Grace A.C. Bhaktivedanta Swami Prabhupada and a Jesuit priest took place in May 1975 at the Hare Krishna center in Melbourne. Material activity simply entangles us in the repetition of birth and death. This is called pravritti-marga, “activity for sense enjoyment.” Everyone is busy working for sense enjoyment. The tiger is busy. The hog is busy. The dog is busy. And if a man also becomes busy for sense enjoyment like the tigers and hogs and dogs, then in his next life he may become one of those species of life. Srila Prabhupada: No, spiritually they are of equal value, although materially their bodies may be of different gradations. It is just like the different gradations of motorcars. A man sitting in a Rolls Royce thinks he is very important, and a man sitting in a Ford or Chevrolet thinks he is poor. But as men both of them are equal. Similarly, the body of a human being and the body of a dog are just different machines, but the souls are of the same quality—part and parcel of the Supreme Soul, Krishna. Srila Prabhupada: Yes, that is false pride. Modern scientists are taking false pride in their accomplishments and saying there is no need of God—“There is no God. We can do everything.” This is their foolishness.